There's been a lot of talk about Barack Obama being a President who reads and knows about poetry. Well, I've taken all this with a few grains of salt, but was quite interested to see that in his recent message to Iran, Obama quoted the 13th-century Persian poet Sa’di - who is, you might say, to Iranian culture what Shakespeare is to ours. "I found a book—tattered, incomplete—with a newspaper cover on it marked Oriental Tales. I bought it, in French. It turned out to be part of the early 19th century prose translation of Firdausi, and it was absolutely fascinating. 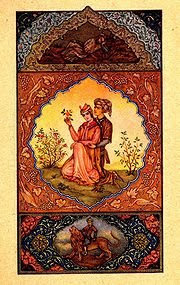 I got into the middle of the story of the education of Zal and the birth of Rustam—and the story came to an end! It was quite impossible to leave it there, I was desperate to know what happened next. I read it, as far as it went, to Pound and Dorothy Pound, and they were in the same condition. We were yearning to find out, but we could think of no way. The title page was even missing. There seemed nothing to do but learn Persian and read Firdausi, so, I undertook that. Pound bought me the three volumes of Vullers and somebody, I forget who, bought me Steingass's dictionary, and I set to work. It didn't take long. It's an easy language if it's only for reading that you want it." Bunting applied for a Guggenheim in 1932 to translate the poem (which tells the history of the kings of Persia from mythical times down to about 628 A.D. in some sixty thousand couplets); he didn't get one. He even named his children for figures in the poem: daughters Roudaba (b. 1934) and Bourtai (b. 1932), and his son Rustam (b. 1937, d. 1953). Bunting went on to spend much of his long life reading, translating, or thinking about Persian poetry: at one point he lived in Iran (apparently working as a spy! ), married an Iranian woman, and spent time "amongst the nomadic mountain-tribes, who taught me to ride & to shootmoufflon and ibex." Late in his life, wrote the foreword to Omar Pound's fascinating Arabic & Persian Poems in English. the day the schooner put out. too deep for a diving thief. Tears are for easy grief. "By calling these works 'Overdrafts' Bunting publicly affirms that he has come to an understanding of indebtedness with the poets who, as it were, underwrite him. On that basis, he can only supply what is provisional—a draft—and must also in some sense obscure, write 'over,' the work of his poetic betters. But to take out an overdraft is usually to smoothen cash flow problems: in this case by translating these works, the poet keeps his own poetry moving, in currency, in credit." Ah, cash flow problems! The poet is prescient. there is no longer any evidence that they ever existed. his dust's so devoured not a bone of him's left. though a lot has happened since Naushervan died. If a few publishers give the go-ahead, a book on Bunting's Persia may soon be in the works. Tell them we will pre-order! I love this—"There seemed nothing to do but learn Persian and read Firdausi, so, I undertook that." The way he makes that solution sound SO OBVIOUS. I seem to recall Bunting saying that his referees for the Guggenheim were Eliot and Yeats for the poetry side of things, and a professor at the University of London (?) for the language bit.